Partnering with God’s work through SIM South Africa is now easier, thanks to the introduction of online giving. “Here is your opportunity to support God’s work in missions from the comfort of your home or wherever you are in the world, and at your convenience,” said Country Director Siegfried Ngubane. 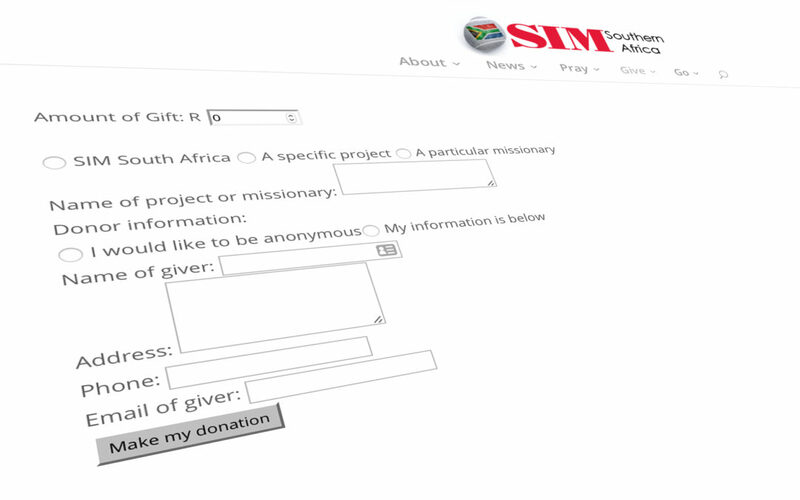 The new online giving function allows people to donate to SIM South Africa in general, to a project, or even in response to a particular news story. Links to online giving can be shared through social media and even in print through QR codes. All online payments are managed by PayGate, an established company trusted by over 10 million cardholders. Donors will enter their payment information in a form that communicates directly with PayGate, allowing them to process payments securely. No card information is handled or held by SIM South Africa. SIM South Africa encountered many delays in establishing online giving, but it was important to establish it properly and securely. Now that it is available, it opens many possibilities for making donation much easier for those who wish to participate in God’s work of reaching those living and dying in least-reached communities. “With online giving available on our website, donors will have an opportunity to give spontaneously, faithfully and without a lot of hassle to a missionary, project or specific funds as they feel prompted by the Lord,” said Stewardship Officer John Berry.